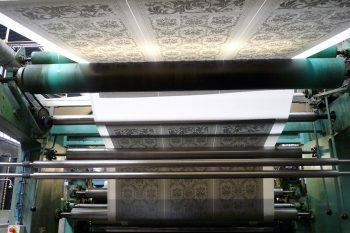 Originally, in the second half of the 17th century, textile printing was done with wooden blocks. This technique allows for a virtually unlimited number of colours to be included in the design. Each block represents one colour. One wood block could take up to a month to engrave. 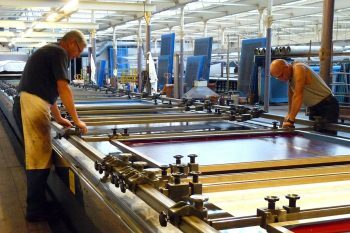 Screen printing, which first appeared at the Manufacture d’Impression sur Etoffes in 1937, gradually replaced block printing. An artist designs a motif, which is then reproduced as a stencil. As with block printing, one screen is necessary for each colour, which put together, make the complete design. It is work that requires care and precision and where the teamwork between the printer and his assistant must be faultless. 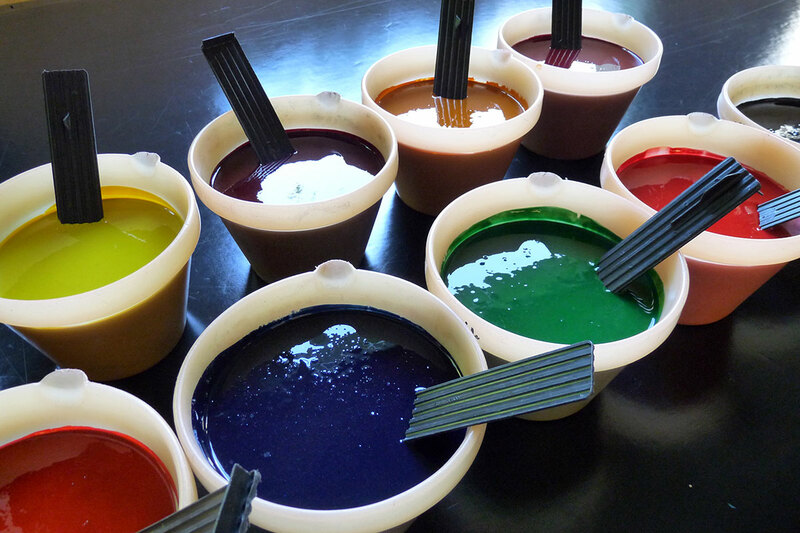 The dyestuff is poured into the screen, its consistency checked, and the surplus removed. The two printers must harmonize their movements to spread the colour evenly. This must be repeated with a different screen for each colour of the design. A unique skill, when you remember that the designs of certain tablecloths have twenty or so colours in them. 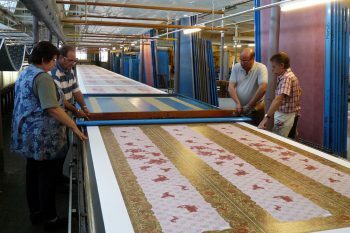 This is followed by the steaming process which fixes the colours and makes them fast, after which they are dried and finished. 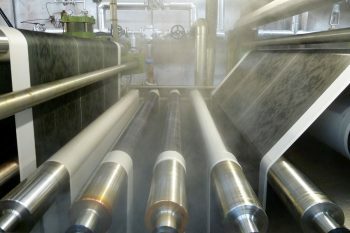 bleaching which removes the starch and grease in the cloth present when it is being woven. The printing is always done with vat dyes for their fastness.They are resistant to washing, dry cleaning and light. 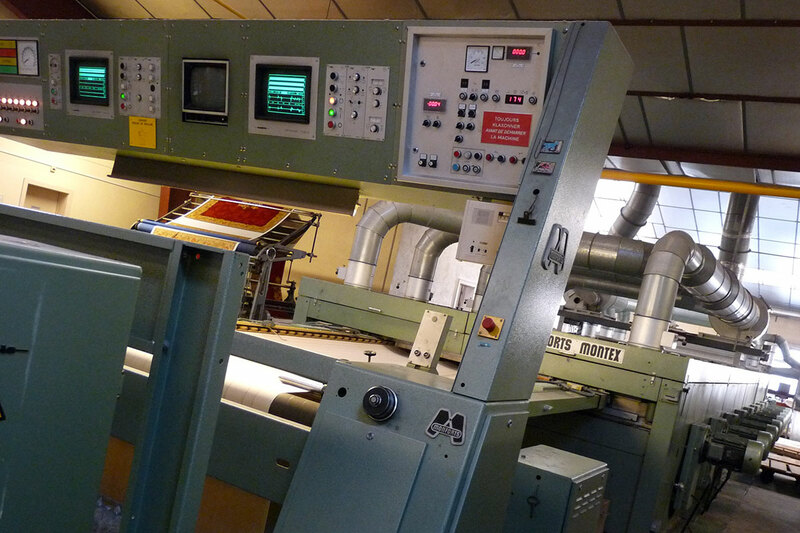 MIE is one of the last hand printers in the world. This technique ‘dry on wet’ is of impeccable quality and can be done in an infinite number of colours. The dyes are mixed in the ‘colour kitchen’ which uses 20 base dye colours and is entirely organised by computer. ‘Machine’ printing is used for printing designs with fewer than 20 colours and not too large a repeat. 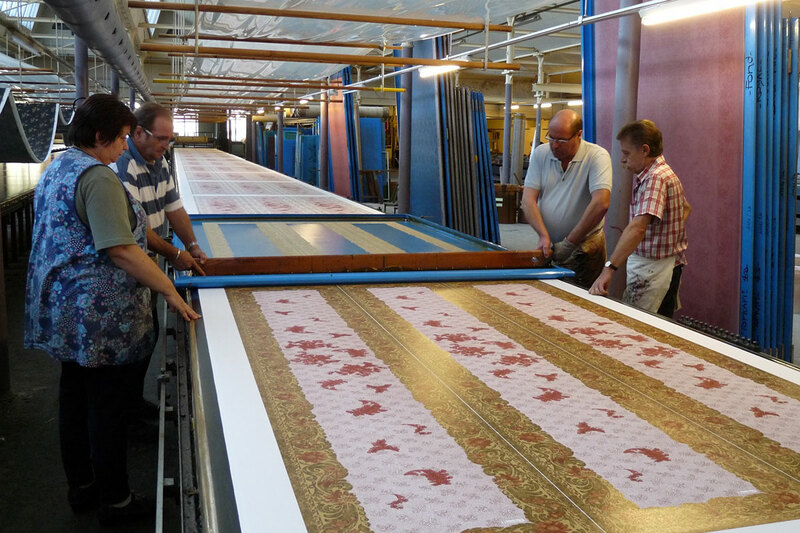 The cloth undergoes more than 15 treatments, both before and after printing. This is the stenter which makes sure the cloth is straight on grain. Steaming develops and fixes the dyestuffs and makes them colourfast.During the course of production, quality is checked 6 times to ensure a perfect end result. During the course of production, quality is checked 6 times to ensure a perfect end result.